While riding on a rural road in eastern Uganda, I found a lady selling mangoes and oranges along the road. I stopped to buy from her thinking that prices would be lower than in the city. To my shock, she quoted a price in the same range as that of my urban market. It was later revealed to me that she used her phone to always keep abreast of the city prices in order to get a fair deal from the middlemen who buy from her. Traditionally, radio and occasionally television were the major communication technologies used to reach out to farmers and it was a largely one way approach availing them weather information and advertising input suppliers. Extension services were always physical face to face activities that also had a patronizing approach. Farmers had challenges learning easily from one another especially across different geographical locations. An ICT Kiosk in Arapai Sub-county Soroti District. For two decades now, Uganda has had e-agriculture initiatives in place courtesy of the work by some Non-Governmental Organizations like the Busoga Rural Open Source Development Initiative and Women of Uganda Network, IT innovations like Drumnet, Esoko, Community Knowledge Worker, Farmers’ Friend among others. However, with all due respect, a number of these innovations are products of people who hardly know what it’s like to be a farmer. This has resulted into a gap between the numerous IT innovations that are touted as life changing applications at competitions and their eventual applicability in the agriculture field. The situation has been aggravated by the financial rewards that are being doled out to untested ideas as a means of encouraging the innovators causing many to turn into rent seekers. Uganda’s economy is dominated by the agricultural sector, which accounts for 41.6% of the Gross Domestic Product (GDP), 85% of the export earnings and 80% of employment opportunities. The sector however has continuously been confronted with challenges of increasing production amidst a rapid growing population and food demands globally, decreasing availability of natural resources like water, declining soil fertility, effects of drastic climate change, outbreak of pests and diseases, and rapid decrease of arable land due to population pressure and urbanization. With a robust growing ICT Sector in Uganda especially in Telecom, and Communication and Information industry, the integration of ICTs in agriculture is increasingly important (FAO, WSIS 2002-2005). Agri-business is emerging field focusing on the enhancement of agriculture through ICT processes. More specifically, Agribusiness involves the conceptualization, design, development, evaluation and application of innovative ways to utilize ICT tools and application systems. Africa is currently gripped in the Information Technology (IT) wave that seems to be sweeping every country off its feet. If an Agro-ICT Innovation Hub existed, it would make it easier for one to blend the technologists with these subject matter specialists hence benefiting the industry in the long run.This coupled with Mobile telephony can be used to extend agricultural information and knowledge to farmers. Agricultural information is one of the most important factors of production and there is no doubt that this can lead to development. It is the best knowledge application that will drive development and create best opportunities for sustainable development and poverty reduction. The effective integration of ICTs in the agricultural sector will lead to sustainable agriculture by providing timely and relevant agricultural information, which will enable farmers make informed decisions on farming to increase productivity. A farmer in Bulindi, Hoima District Shows an extension worker her Harvested Onions. ICTs can also greatly improve farmers’ accessibility to market information, commodity inputs, consumer trends, which positively impact on the quality and the quantity of their produce. Information on marketing, new plant and animal management practice, pest and diseases, transport availability, new marketing opportunities and market prices of farm input and output is very important to an efficient and productive economy. Information sources like tele-centres, community radios and phones can be used to obtain and disseminate agricultural information in information centers. These should be considered and constructed nearer to other rural communities in Uganda. Agricultural information provided or disseminated is usually in all accessible forms like written, audio and visual form. This caters for all categories of farmers especially those who are unable to read and write. For instance in Kabarole research centre and Kubere information Centres, radios have been used to disseminate agricultural information through weekly agricultural broadcast. Programmes are run in local languages to inform farmers of weather situations in their localities or district, to provide answers to farmers’ agricultural needs. The use of ICTs can empower rural farmers in Uganda by availing timely and relevant information for them to participant in decision making, exchanging ideas with other farmers in developed and developing countries in order to improve on the quality of their agricultural produce. Thanks Prof: I was just restricted by the number of words required by the organizers otherwise I too felt it was necessary. But I am working on a full paper in the same line where I have fully given all the credit to Agshare and CoCIS. Otherwise I am greatly humbled by your response and ideas. Eric this is good work courtesy of RUFORUM. 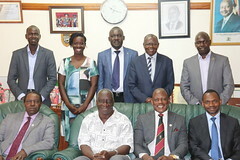 However you should have also given credit to AgShare II project implemented by College of Computing and Information Sciences and College of Agriculture and Environmental Studies, Makerere University that significantly contributed to the information gathering in Eastern Uganda- Soroti and Western Uganda- Hoima.